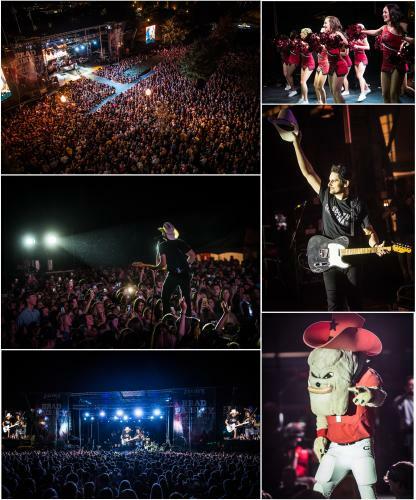 NASHVILLE, Tenn. (October 20, 2015) This past weekend Brad Paisley played the last two college stops on his Country Nation College Tour presented by Zaxby’s. This fall he took his tour to nine IMG College partner universities and provided free entertainment for the campus community. This weekend he played to capacity crowds at the University of Georgia and the University of South Carolina. Eric Paslay was special guest on the tour. The show at the University of South Carolina showed support for the greater Midlands community that was heavily impacted by recent flooding. Approximately 1,800 first responders and their families were in attendance as special guests and every time #countrynationsc was posted on social media that evening $1 was donated to the local United Way – Midlands by Paisley and Zaxby’s.